Are you considering an electric car but don't know where to start? 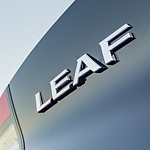 Lithia Nissan of Eugene is happy to introduce you to the Nissan LEAF. The Nissan LEAF is an electric car that features all the newest technologies. The Nissan LEAF keeps you in your lane when you're driving in Eugene. The LEAF's Intelligent Lane Intervention uses a combination of sensors and cameras to determine when the vehicle drifts out of a lane. The LEAF will alert you if you stray from your lane and tap the brakes if you aren't paying attention. The Nissan LEAF's tech features will keep you connected. You'll have the ability to sync all of your favorite devices with the LEAF's infotainment system, so you'll never miss your favorite podcast again. You can even access the LEAF's climate control system remotely, so you can warm up your car on cold mornings or cool it down on summer afternoons.